The 6 components of Open-Source Data Science Ecosystem; Did Python declare victory over R? Python eats away at R: Top Software for Analytics, Data Science, Machine Learning in 2018: Trends and Analysis. Here we take a more detailed look at which tools go well together. we identified last year has received a new entry - see below. We provide a link to anonymized dataset at the end of the post - let me know what else you find in the data, and please publish or email me the results. we selected the tools with at least 400 votes. There were 11 such tools, and this selection also makes sense because there was a big gap between n. 11 (Apache Spark, with 442 votes) and n. 12 (Java, 309 votes). We then grouped together the tools with the strongest association, starting with Tensorflow and Keras, until we arrived to the figure 1 below. To reduce clutter, we also filtered it to show only associations with abs(Lift1) > 15%. The bar length corresponds to absolute value of lift1, and the color is the value of lift (green for more Python, red for more R). Python, Anaconda, scikit-learn, Tensorflow, Keras, and Apache Spark. go strongly with any other tools. R has small positive associations with Apache Spark, SQL, and Tableau. We note that although chart below is symmetrical relative to diagonal (top right triangle is equal to bottom left), the patterns are easier to see in the full chart, rather than half. where pct(X) is the percent of users who selected X. 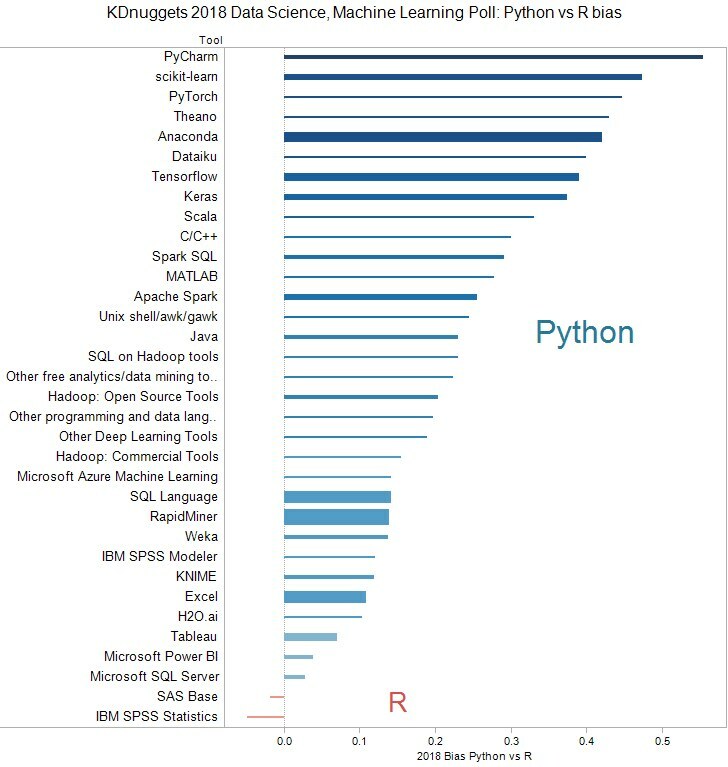 Next we examine Python vs R.
% of tool X usage with R.
, which is positive if tool is more used with Python and negative if it is more used with R.
there were 10 such tools: SAS Base, Microsoft tools, Weka, RapidMiner, Tableau, and Knime, and almost all became more used along with Python. Did Python declare victory over R? I don't think so, because R is an excellent platform with tremendous depth and breadth, which is widely used for data analysis and visualization, and it still has about 50% share. I expect R to be used by many data scientists for a long time, but going forward, I expect more development and energy around Python ecosystem. 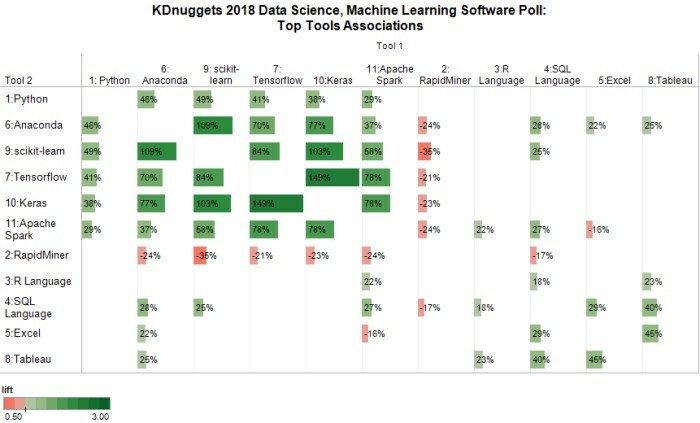 Big Data (Spark / Hadoop tools) were used by 33% of respondents in KDnuggets 2018 Software Poll, exactly the same fraction as in 2017. This suggests that most Data Scientists work with medium / small data that does not require Hadoop / Spark, or they use other data in the cloud solutions. However the fraction of Deep Learning tools grew to 43% from 32%. For each tool X, we compute how frequently it is used with Spark/Hadoop tools (vertical axis), and how frequently it is used with Deep Learning tools (horizontal axis). and Big Data tools themselves. We note that Scala is the most used language with both Deep Learning and Big Data. 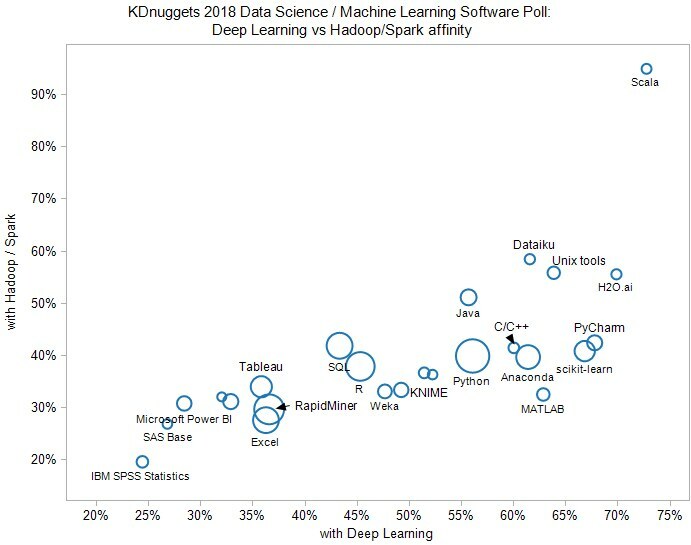 The chart is heavy on the lower left side, with almost every tool being used more with Deep Learning than with Big Data tool. RapidMiner: 1 if Votes includes RapidMiner, 0 otherwise. SQL Language: 1 if Votes includes "SQL Language", 0 otherwise. Excel: 1 if Votes includes Excel, 0 otherwise. Anaconda: 1 if Votes includes Anaconda, 0 otherwise. Tensorflow: 1 if Votes includes Tensorflow, 0 otherwise. Tableau: 1 if Votes includes Tableau, 0 otherwise. scikit-learn: 1 if Votes includes scikit-learn, 0 otherwise. Keras: 1 if Votes includes KNIME, 0 otherwise. Apache Spark: 1 if Votes includes Apache Spark, 0 otherwise. With DL: 1 if Votes includes Deep Learning tools, 0 otherwise. With BD: 1 if Votes includes Big Data tools, 0 otherwise. Votes: list of votes, separated by a semicolon ";"